Over the last 6 years of daily use for assignments all over the world, I have dropped my camera two times. Once in 2002 and once in 2006. It happens to everyone no matter how careful you try to be. I've been darn lucky. 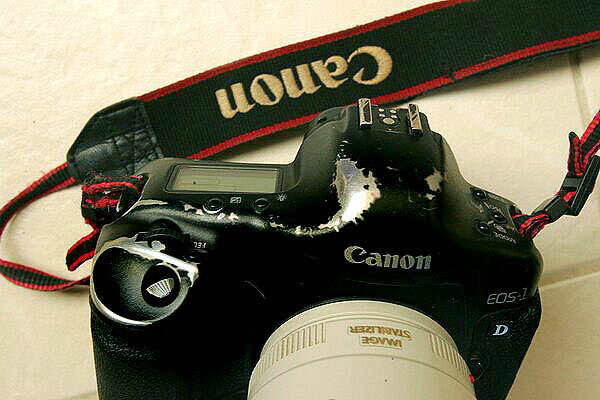 Back in 2002 I dropped my D1X, SB-28DX flash and 17-35mm f/2.8 while covering the Danielle Van Dam murder case the day before I was to leave on a two month-long photo assignment to Africa. It looked pretty bad...you could actually see daylight between the mount and lens! My friend Ken Rockwell tested it for me and it seemed to work OK. Since there was no time to send it to Nikon for repair, I took it to Africa's dusty environment with a rubber band wrapped around the mount, in an attempt to keep the dirt out ! When I returned, I thought for sure Nikon would say that I had bent the camera's frame. The frame was deemed straight and Nikon professional services repaired the lens mount, bringing my $5,000 D1X back to like new condition for $800, far less than purchasing a new one! 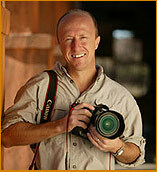 In 2006 while trying to help one of my photo tour guests get off an elephant in Jaipur India my Canon Mark II with my Canon 70-200mm f/2.8 IS lens attached, slipped off my shoulder and dropped about 9 feet down onto the cobblestone road. I watched it fall in a surreal slow motion dreamlike sequence. It seemed like an eternity and when it hit the ground I was sure it would be a total loss. To my surprise it hit, flipped over and landed with a thud. Almost immediately the inquisitive elephant began examining it with his trunk. I leaped off the platform to retrieve the rig. Standing at the elephant's feet, I put the camera up to my eye and snapped a few frames...to my amazement, an image appeared on the camera back ! For the next half hour I examined the camera and lens, took photos and determined that it seemed to be acting normal. Boy was I lucky, I used the camera for the next 4 weeks, shooting assignments in Bihar and Calcutta before returning home to San Diego. 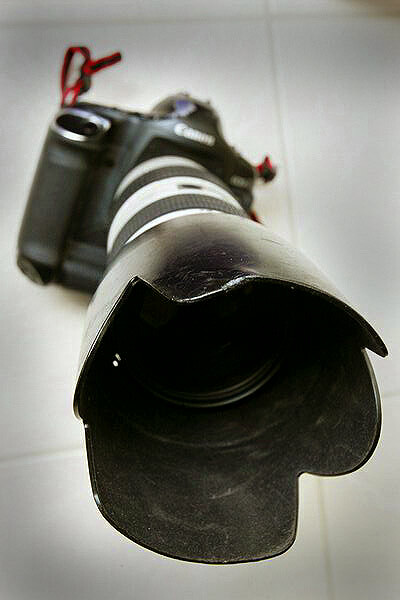 Apparently the lens hood absorbed most of the impact...it bent slightly but other than that...no problem ! If this isn't a testimonial for diligent use of lens hoods, I don't know what is ! Above you can also see the scrape marks on the hot shoe (suffered during the drop in India), and the burnishing from heavy use in places like Haiti, Afghanistan, Sudan and at the tsunami in Indonesia. I consider my cameras as "tools" and although I try to be careful when handling them, I am not overly concerned about scratches dings and aesthetics. The bottom line is that the camera still works great....one reason to spend a bit more on a professional body if you plan on making a living in photojournalism. Upon my return from India, I again asked my friend Ken Rockwell if he was interested in testing it to see if there were any problems. Ken did an incredibly thorough job of testing and posted his finding here on his website. Of my dropped Canon 70-200mm f/2.8 IS, Ken said" it's one of the best lenses I've tested for real-world use".